This 46-year-old female patient had a history of repeated self-induced blunt force trauma to both eyes. She initially presented with anterior lens dislocation with pupillary block in her right eye (Figure 1). 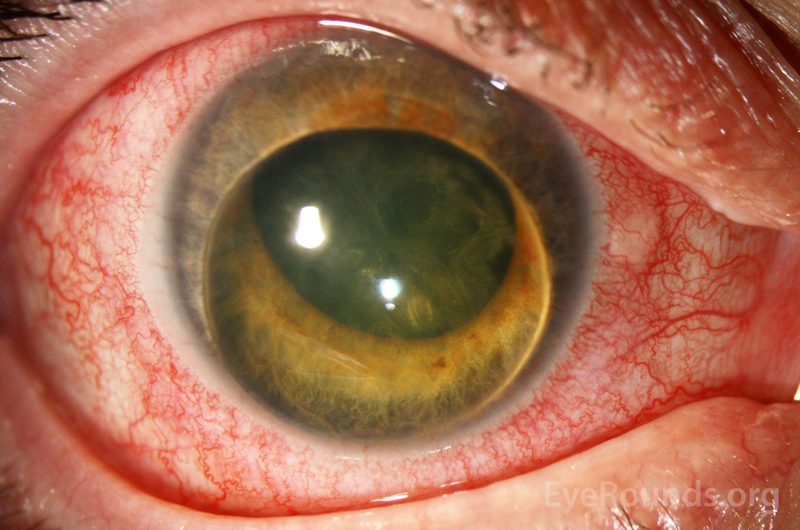 She then presented seven months later in angle closure and with a mature cataract in her left eye (OS). Blunt trauma causes abrupt anteroposterior shortening and resultant equatorial stretching that may lead to zonular rupture and lens dislocation . Phacomorphic angle closure may occur when a mature cataract pushes the iris forward, which is demonstrated on her anterior segment optical coherence tomography (Figure 2). Her lens thickness (LT) OS was 5.36 mm; the average LT for patients between 36 and 50 years is 4.05 ± 0.20 mm . Lensectomy is the definitive treatment for both phacomorphic angle closure and pupillary block secondary to lens dislocation. Figure 1. Slit lamp photograph of the right eye shows 3+ diffuse injection with the crystalline lens filling the anterior chamber, lenticulocorneal touch, stromal edema, 360 degree iridocorneal touch, and posterior capsule opacification. Intraocular pressure was 40 mmHg at presentation. Figure 2. 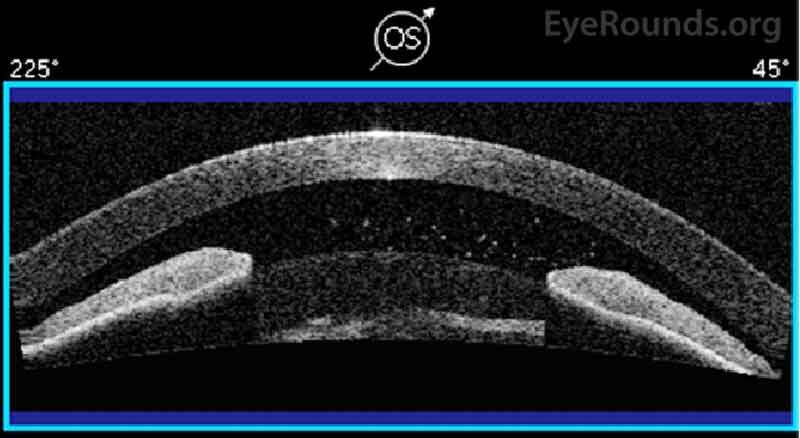 Anterior segment optical coherence tomography (AS-OCT) of the left eye. The perpendicular distance between the anterior pole of the lens and the horizontal line between the scleral spurs on AS-OCT (i.e., lens vault, LV) was greater than 1042 microns. Based on a study by Moghimi, et al., the average LV value in controls is 391.7 +/- 377.4 microns, and an LV greater than 1042 microns increases the risk of developing phacomorphic angle closure 12 times . This parameter distinguishes phacomorphic angle closure from that of acute primary angle closure .